So you have decided to take the plunge into starting a home garden. Maybe you have decided that you want to grow your own fruits and vegetables in your backyard or landscape your outdoor space. Every garden is different and that means that the level of upkeep that goes into maintaining your green space varies depending on the type of garden you decided on. Put on your gardening gloves and get ready to dig in the dirt! Here’s what you need to know to start a garden. By definition, a garden is a plot of ground used to grow vegetables, fruits, flowers, herbs and a variety of other plants. Gardens can be found in the backyard of a home, on the rooftops of buildings, in the community where locals work together to maintain the garden, the White House vegetable garden and the dreamy garden grounds at the Palace of Versailles in France. 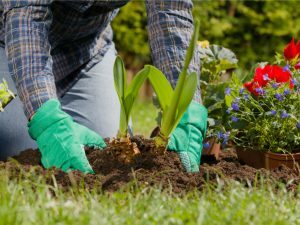 Whether you are landscaping with flowers and shrubs or trying to grow your own fruits and veggies, gardens are a unique way to add flair and value to your home, community and expand your personal interests. Gardens come in all shapes in sizes. There are herb gardens, butterfly gardens, Mediterranean gardens, vegetable gardens, flower gardens, botanical gardens, gardens built in raised beds, vertical gardens — the list goes on and on. The type of garden you grow may also depend on what region of the country you live in. History tells us that the first gardens appeared in Egypt more than 4,000 years ago. Egyptians placed groups of plants in encasements and the idea of gardening was born. Over the years, gardening has evolved and adapted to different regions and climates around the world. It is estimated that there are currently over 400,000 species of plants. Fancy gardens were a staple of the Roman Empire. The popularity of gardens continued to travel through Europe and eventually in the Renaissance gardens were created and maintained for pleasure. Back then, gardens were considered a work of art. So much so that famous painters from the surrounding eras began to incorporate flowers into their paintings. Fast forward to modern times and gardens are a staple of home yards and local communities. Home gardening is among one of the most resurgent trends in recent gardening history. According to the American Gardening Association, 35 percent of U.S. households grow their own fruits, vegetables and herbs at home or in a community garden as of 2014. That is an increase of 17 percent in just five years. In total, more than 42 million households have a home garden. Hot, cold, dry, wet — every environment is different and therefore a garden in Washington State is going to look different than a garden in Florida. Different regions of the country tolerate different types of plants. Some plants may thrive in wet, shaded climates while other plants need less water and more sun. The soil also varies in different climates. According to the United States Department of Agriculture, there are 11 different planting zones across the country. These regions are referred to as hardiness zones. Each one is 10 degrees warmer or colder than the adjacent zone during a typical winter season. These zones tell you about the garden climate where you live, such as what to plant and when. Vegetables are broken up into two different categories: warm season and cool season. Peppers, corn, cucumbers and tomatoes grow best in hot weather and should be planted in summer when the soil is warm. Vegetables such as lettuce, spinach, broccoli and peas grow best when the weather is cold and can survive a light freeze. In the southern region of the U.S., where it is hot and wet during the summer, perennials plants like crinums and yellow flag iris are low maintenance options for a flower garden. In the Midwestern part of the country, perennials like butterfly weeds, Lenten roses and Virginia bluebells grow best and come back year after year. In dry, warm weather climates such as Arizona or Nevada, you can have a desert-style garden made up of cactuses, succulents and other dry-weather plants that thrive in full sun and do not need much rain. In states like Georgia, where much of the ground is made up of clay and sand, plants like castor beans and miscanthus, an ornamental grass, thrive in soil. One downside to clay is that it can hold a lot of water, which can be detrimental and suffocate some plants. Before you get started with your garden, do your homework to find out which plants grow best in your region during each season. No matter what you are growing, these tools and materials will help you maintain your garden throughout the year. In addition to these basic starter materials and tools, you need seeds or plants to place in your garden. Research local nurseries in your area. They will have the highest quality seeds and plants for you to begin with. You may even pick up a few insider tips during your visit. If you do not have a plant nursery nearby your home, you can purchase seeds online from reputable dealers. If you are building a raised-garden bed for a vegetable garden, you need a yardstick or other measurement tool, Cedar planks in various sizes (this will vary depending on the size of your garden bed), screws and nails, as well as a hammer, screwdriver or drill. The decision to start a garden may sound simple, but there are many factors to consider before you start planting. A well-maintained garden takes hard work and dedication, but is worth the effort. Before you start your garden, consider the advantages and disadvantages so you know what you are getting yourself into. Gardens provide food such as fruit, vegetables and herbs, which can cut down on grocery costs down the road. Studies have found that gardening can improve depression symptoms. You have total control over what type of plants to grow, as well as what type of pesticides and other chemicals to use or not use in your garden. Working outside in the garden can be a peaceful way to take your mind away from stressors in your life and allow you to connect with nature. If you curb your use of chemicals, you help to cut back on pollution and groundwater contamination. This is better for the environment. Many gardens feature a compost pile. Compost piles decrease the need for chemical fertilizers, enrich the soil and encourage the growth of nutrients in the soil. You may not drop pounds while gardening, but there is a fair amount of exercise that comes along with it. From lifting heavy bags of soil to walking around the yard, gardening offers low to moderate exercise. If planting flowers and shrubs, you can have your own luscious oasis in your backyard that can provide a relaxing space to read a book, meditate and do other soothing activities. Maintaining a garden can be time consuming. Make sure you are available to tend to your garden as needed. Starting a garden can be costly because you may need to rent a tiller to clear space, buy the materials to build a garden bed, soil, seeds or plants and other necessary materials. If you travel frequently, a garden might not be the right choice for you. Even with the aid of sprinkler systems, gardens flourish when taken care of on a daily basis. You may get sunburned while outside, so remember to wear sunscreen, a hat and cover up with a breathable long-sleeve shirt. Gardening, while not for everyone, can be a rewarding yet challenging experience when done correctly and expectations are properly managed. So you have decided to start your first garden but you are not sure where to begin. Decide what type of garden you want to plant. Is it herbs, fruits and vegetables, flowers? Once you have that narrowed down, locate a space on your property for the garden. Most plants, especially vegetables and flowers, need at least six hours of full sun. Keep that in mind as you search for a garden space and spend a day or two observing what parts of your yard get the most sun and for how long. Depending on the size of your area, you may be able to place a raised garden bed in your backyard. Now that you have secured a space for your garden, it is time to prep the area for planting. Measure out space and clear a section of the yard by digging up the dirt. Typical yard soil does not have enough nutrients to support a growing garden, so you need to prime it with two to three inches of compost, manure, decayed leaves or grass to give it a boost. Turn the top eight to 12 inches of soil with a garden fork or shovel. Mix in the compost matter. While you’ve got the area dug up, incorporate organic mulch into your soil to help keep future weeds at bay. Whether you are planting seeds or starting with plants that have gotten a head start from a nursery, each one comes with instructions for sowing. Follow the directions, including when to plant, how deep to bury the seeds or plant roots and the distance between each. Also, take note of how often the particular plant needs to be watered. It is likely every day, at least at the beginning. Make sure you make a mental note or write it down somewhere safe. The best time to water your plants is in the morning before the sun is high above. This maximizes the amount of water that penetrates the plants before it is absorbed by the sun. To maintain your garden, weed it on a weekly basis or whenever you see a weed pop up to help your plants thrive. Plants should be pruned to help trigger new growth and maintain their health. Knowing when to prune your garden depends on what type of plants you have. Typically, trees and shrubs get pruned in the springtime. Flowers and fruit plants should be trimmed back when they are not actively growing. If you are growing edibles, harvest them as soon as they are ready. Do not let your vegetables sit on the vine or stem for too long after they’ve ripened. Otherwise, you may end up with a garden full of critters and nothing to show for all of your hard work.